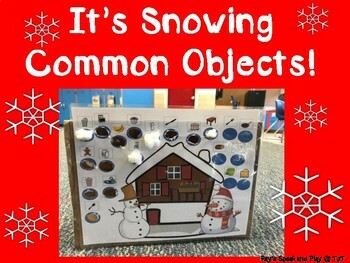 Snowing Common Objects is an interactive activity where students place “snow” (cotton balls) in every hole while labeling each common object. All common objects are environmental items found in a kitchen. 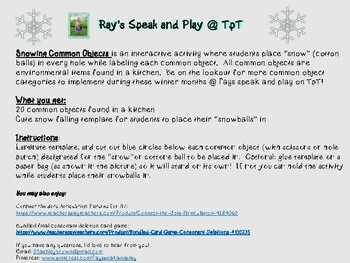 Be on the lookout for more common object categories to implement during these winter months @ Rays speak and play on TpT! 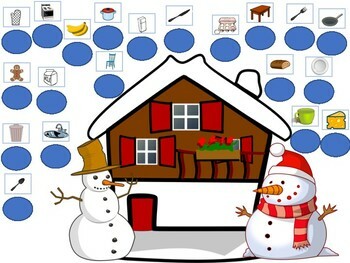 Laminate template, and cut out blue circles below each common object (with scissors or hole punch) designated for the “snow”or cottone ball to be placed in. Optional: glue template on a paper bag (as shown in the picture) so it will stand on its own! If not you can hold the activity while students place their snowballs in.